It might look weird to some of you because it is written in Dutch. Bassicly, what it says is: "You can only run one copy of MediaCapture or Plug & Burn at a time". 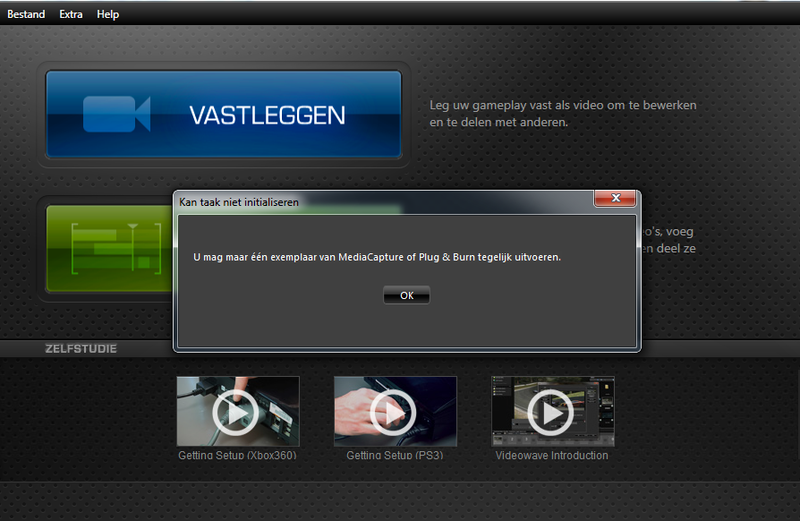 This message is preventing me from getting to capture any footage. Anyone have an idea of how to resolve this problem? Open task manager, find the process and end it, now re-open the software. How long did you wait for it to end the processes? Post a screen shot of the TaskManager window please. I have a Apple Macbook with Intel i7 and AMD Radeon HD 6750M graphics card. I'm not sure if you need the rest of the specs as well, but I'm not to familiar with how to find out about that. I was also running Chrome in the background, including a video chat with a buddy of mine on Google+. Besides that, I had skype and Windows Live messenger on. Next time shut all that crap off and see if you have the problem. Roxio software has had issues with skype in the past!